Sat in our local watching Scotland's non-event against the All Blacks at the 2007 Rugby World Cup, a friend turned to me and said, 'I hate Dan Carter. He's just played 20 minutes of international level sport and he's not even sweating'. He may have missed a conversion with the last kick of the game in Dublin, meaning that he will have to wait until next weekend to join Jonny Wilkinson atop the scoring charts, but Carter was at his languid best as a vastly improved Ireland came up well short against New Zealand on Saturday. Certain people appear born to play and Carter makes Test match rugby look like the most natural thing in the world. Ireland, when confronted by the biggest challenge in world rugby, lifted their game accordingly after a dour loss to South Africa and sneaked win over Samoa, but there was always the sense that the All Blacks' playmaker was cruising and that at any moment a dab on the accelerator could spell the end. The same was true of his team-mates and Carter's life was undoubtedly made easier by another stunning effort from his pack, and back-row in particular. In the end, it was all maddeningly familiar for the home side. Roared on by a crowd hoping to see history made, hoping to have their own 'I was there' moment, Ireland fought gamely, even took the lead, before fading in the face of the All Blacks' clinical attack. In 15 minutes either side of half-time the tourists ripped victory from their grasp, with lock Anthony Boric sparking Ireland's downfall with a horrible suckerpunch just before the break. Kieran Read pounced twice and Sam Whitelock once after the break, with the All Black back-row seemingly stung into action by a fired-up start from the Irish trio of Stephen Ferris, David Wallace and Jamie Heaslip. Ferris' try, a brilliant line combined with an always-helpful forward pass, prefaced New Zealand's onslaught and finally created an atmosphere at the previously funeral Aviva Stadium. Ireland also brought some of their strike runners into the game after bemoaning the conditions in recent weeks - perhaps their complaints should not be dismissed as they appeared a rejuvenated force with Luke Fitzgerald, Rob Kearney and Brian O'Driscoll on the ball. Where they struggled was in containing the marauding All Blacks' ball-carriers. 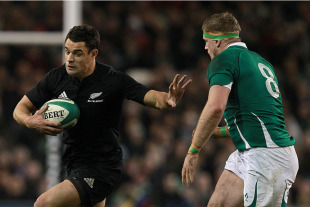 While Wallace is expected to get through a hell of a lot of work with ball in hand for Ireland, New Zealand can call on eight powerful runners in their pack. On a number of occasions Ireland went from being comfortable to being outflanked in the blink of an eye because of the abundant support provided for the ball carrier. Sonny Bill Williams' one-handed rugby league offloads have been singled out in recent weeks with good cause, but the entire side has the offloading philosophy close to their heart. With the likes of Jerome Kaino, Read and Richie McCaw making comfortable yardage with their options assessed, the likes of Hosea Gear, Mils Muliaina and Conrad Smith will flourish. Unless the forwards decide that they're quite happy to finish the job themselves - something they did with aplomb in Dublin. Ireland can take positives from their performance and will hope to produce the same intensity against Argentina next weekend. It's a troubling thought however that their best performance of the autumn resulted in a 20 point loss to a side that apparently had more in the tank. The World Cup is now under 12 months away and with South Africa in disarray, Australia still learning their trade and England taking baby steps there will be massive pressure on the hosts to perform. Over to you, Mr Carter.